On this page you will find various general articles. If you join the Y & C Club, you will have access to much more detailed information and fellow members who have practical detailed knowledge of the Ford Y and C model range. Pascal Planke, in France, has an early Model "Y" engine fitted with the original Champion 7X, 18mm spark plugs. Ford Motor Company sourced and fitted these plugs to the early narrow block (4.53 inches) engines. Post-January 1935 (Y89686) the Model "Y'', 8 h.p. engines, still with narrow blocks, were fitted with the smaller Champion L10, 14mm plugs. In May 1935 the 8 h.p. block was widened to 4.65 inches to enable the same moulds to be used for both the 8 and 10 h.p. Model "C" cylinder blocks. The smaller Champion Lio, i4 mm spark plugs were common to both engines thereafter. Regrettably the Champion 7X plugs are no longer available. The Green Spark Plug Company have been very helpful and identified: - 1. The modern equivalents to the 18mm Champion 7X as the Champion D16: NGKAB6: Bosch M8AC and the Denso M14. 2. The modern equivalents to the 14mm Champion L10 as the Champion L86C : NGK B5HS and Bosch W8AC. The Green Spark Plug Company has been added to the list of Useful Contacts. The adjustable gap between the contacts (points) when fully open will determine the dwell viz. the length of time the points re­ main closed. Sufficient dwell is required to fully charge the condenser. 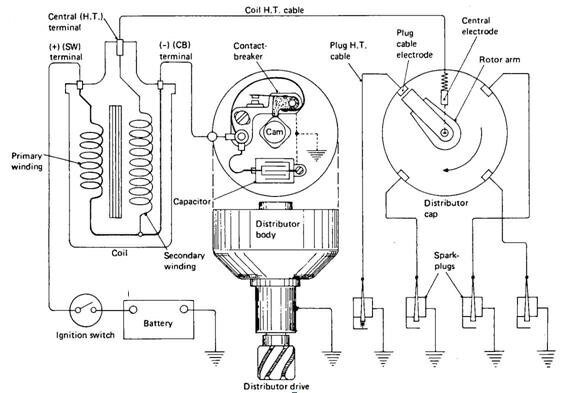 The amount of charge in the condenser will determine the strength of the magnetic field raised in the coil and hence the power of the spark avail­able at the sparking plug electrode. On the model Y/C , the ca in the distribu­ tor which opens and closets the contact points has 4 lobes - one for each cylinder - the cam rotates at half engine speed -so at 2000 crankshaft rpm the noints open and close 4000 times per minute! Once set the dwell will only change if the point gap changes during use, the main reason for this would be wear on the cam lobe fol­ lower or arcing and pitting of the contacts. Regular checking is therefore necessary to ensure the points are correctly aligned and the gap set accordingly: Usually on early engines .018"and onlater models. 012".Too great a point gap will give a smaller dwell angle and a weak spark. Reduced point gap results in late opening of the contact points which will retard the spark, increasing fuel consumption and overheating of the exhaust valves. Points can be smoothed and re-aligned using a fine carborundum stone but are cheap and readily available so should be replaced. Now, what about this condenser? (BSI modern term is capacitor)' it is connected in parallel between the terminals of the points. So having made sure the dwell is correct this is the next item to consider, as it does a major job in giving a powerful ig­ nition spark. When the points close they connect the battery directly to the primary winding in the coil (shorting out the con­ denser). A magnetic tield is created within and around the coil windings. As thepoints are opened by the distributor cam lobe, the magnetic field collapses inducing a higher voltage inthe secondary winding of the coil (which has more turns of wire) with the current continuing to flow in the primary circuit and into the condenser which is now in series with the primary winding and no longer shorted out so it begins to charge. The residual current in the primary wind­ ing charges the condenser to a very high voltage (300+). As the voltage and cur­ rent flow in the primary winding dimin­ ishes the condenser discharges returning its stored charge as a current into the coil primary winding in the opposite direction and so boosting the speed of collapse (it is the speed of collapse which is important) of the magnetic field, so giving a higher in­ duced voltage in the secondary winding of the coil and hence a more powerful spark at the plug electrode. The better the spark the more chance there is of the fuel and air mixture igniting at the correct time in the cycle to give best performance. It is the sudden switching off of the primary circuit current and the rapid collapse rate of the magnetic field as the contact points are opened, by the cam, which induces the high voltage (5000 volts+) in the coil secondary winding of the coil, to be delivered to the sparking plug gap, via the high tension (HT) leads. Always check that there is a good bond (earth) between the condenser case and the body of the distributor or run a sepa­ rate earth or even mount the condenser on the bulkhead - believe it or not this is one of the most common problems with this type of distributor. Always use a good quality condenser, this is a most vital part of the ignition system and needs to con­ tain 300+ volts without leakage. It gives that that vital boost to the spark - cheap versions break-down at quite low volt­ ages. Please remember the condenser is not just there to absorb arcing, to protect the points, as widely believed, although of course it does this also.